Pietermaritzburg - Mitchell McClenaghan’s early three-wicket burst set New Zealand on their way to a comfortable 24-run Twenty20 victory over South Africa 'A' in their tour opener at the Pietermaritzburg Oval on Tuesday. Batting first, the Black Caps posted 140 for seven at as Colin Munro top-scored with 39 off 26 deliveries. Brendon McCullum (32 off 28) also made a handy contribution for the visitors, who start the first of three T20 internationals against the Proteas in Durban on Friday. GALLERY: Black Caps v SA "A"
Kyle Abbott was the pick of the bowlers for the hosts with four for 16, although there was little support with the bat as they ended on 116 for nine. Left-arm seamer McClenaghan claimed three of the first four wickets to fall inside five overs and the South Africans never recovered. There were also three wickets for 36 for slow left-armer Ronnie Hira. 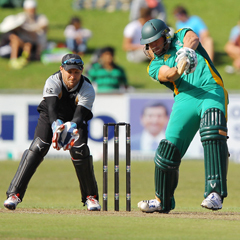 Vaughn van Jaarsveld (43 off 43) top scored for the South Africans, but it was not enough as the Kiwis sealed a comfortable win. South Africa 'A' sprung a surprise by opening the bowling with Roelof van der Merwe, with the spinner striking in his first over by bowling Rob Nicol for a duck. Fellow opener Peter Fulton (5) followed not long after when he skied Mangaliso Mosehle to mid-off, although McCullum had started out brightly at the other end by smashing three fours from his first four deliveries. The Black Caps lost another wicket when James Franklin also failed to connect clearly and top-edged for 10, this time Craig Alexander the bowler and Davy Jacobs taking the catch at mid-on. McCullum, dropped on 29 by Hardus Viljoen, was out to the same bowler in the next over when he skied to David Wiese at mid-off shortly after the 50 was raised. Munro, who was put down at long-off by Mangaliso Mosehle, took up the aggressor role and got going with an early six. At the other end, the wickets continued to fall as Corey Anderson (5) was stumped by Dane Vilas off David Wiese. The 100 came up in the 16th over, before a final flourish from Munro first, and then Nathan McCullum (22 not out off 15) helped the visitors set a target of 141. In reply, left-arm pace McClenaghan bowled Davy Jacobs (4) and Stiaan van Zyl (1) within the space of four balls in his first and second overs. The wicket of Mosehle (5), bowled by Hira, saw SA 'A' slump to 17 for three, before another wicket for McClenaghan left them in further trouble, Vilas the latest to fall with an edge to 'keeper Brendon McCullum. Two more quick wickets - Hira cleaning up captain Justin Ontong for five and David Wiese (1) out to a brilliant diving catch to his right by Nathan McCullum - left the total on 48 for six. Van Jaarsveld tried to keep things going as he took his team past 50 in the 10th over and he temporarily found a fighting partner in Van der Merwe. However, after some brief stability he too fell, followed by the last hope of Van Jaarsveld, caught and bowled by Michael Bates as the hosts slumped to a heavy defeat. New Zealand 140-7 in 20 overs (B. McCullum 32, C. Munro 39, N. McCullum 22 not out; K. Abbott 4-16). South Africa 'A' 116-9 in 20 overs (V. van Jaarsveld 43; M. McClenaghan 3-19, R. Hira 3-35). Result: New Zealand won by 24 runs.